This book examines the politicisation of victims of terrorism and the reality of the victimisation experience within the broader field of terrorism and the resulting conflict. Victims of terrorism are a unique group of individuals whose experience is overlooked in the current literature on terrorism. Since 9/11, terrorism has risen to global prominence and has become a key topic of interest with regards to media attention and national security. As a result, many European countries (as well as the USA) have had to take active steps to protect and provide for the victims of terrorism, particularly given the nature of victimisation post-3/11 (Madrid) and 7/7 (London). Recently, we have also seen an increase in the political currency of the terrorist victim; for example, the lobbying activities and political involvement of the victims of ETA terrorism and the exceptionally powerful lobby in the USA that sees the involvement of victims of terrorism and their families in policy-making and law-enforcement transformations. 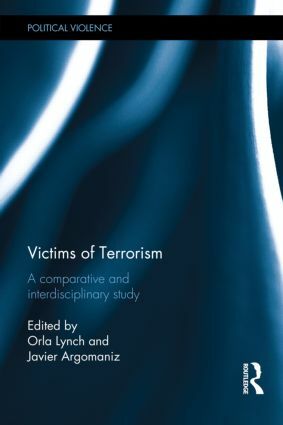 This book is based on extensive field work in Northern Ireland, London and Spain and presents the results, which focus on the needs and experiences of victims of terrorism and political violence, and critically analyses these findings comparatively and in their own right. The aim is to assess the provision of support initiatives in Northern Ireland, mainland UK and Spain and understand if victims' needs are being met by these initiatives but most importantly to construct a picture of the local and international interpretation of the experience of victimisation by terrorism. This book will be of much interest to students of terrorism and political violence, victimology, criminology, security studies and IR. 1. Victims of Terrorism – An Introduction, Orla Lynch and Javier Argomaniz 2. The Construction and Politicisation of Victimhood, Cheryl Lawther 3. Victims Needs and Dealing with the Past, Cheryl Lawther 4. Constructing Needs; Victims of Terrorism, the case of the NI and Spain, Carmel Joyce, Orla Lynch and Egoitz Anton 5. The Needs of Victims in the United Kingdom – Results, Carmel Joyce and Orla Lynch 6. The Needs of Victims of Terrorism in Spain, Rogelio Alonso and Agata Serranò 7. The use of online tools by victims of terrorism and victims’ networks in the United Kingdom and Spain, Gilbert Ramsay & Egoitz Anton 8. European Instruments Concerning Vicitms of Terrorism Rights: Meeting Needs?, Javier Argomaniz 9. Meeting the Needs of Victims of Terrorism – Lessons for the International Context, Orla Lynch and Javier Argomaniz 10. Best Practice Recommendations For Supporting Victims of Terrorism, Lynch, O., Argomaniz, J., Serrano, A., Carmel, J., & Alonso, R.
Orla Lynch is Director of Teaching and Lecturer in Terrorism Studies at the University of St Andrews, and co-editor of State Terrorism and Human Rights (Routledge 2012). Javier Argomaniz is Lecturer in International Relations at the University of St Andrews and author of Post-9/11 EU Counter-Terrorism (Routledge 2011).